This is an in-ground hot tub service customer that lives in the Del Mar Heights area of Carmel Valley, 92130. A hot tub with a pebble sheen surface, glass pool tile and a natural rock quartz stone coping and boulders. We started weekly hot tub service when the new home buyer moved into the home. The previous home owners did the hot tub maintenance themselves though not very successfully. Keeping it clean of leaves and debris are one thing but, the hot tub’s water chemistry was out of balance causing a need to perform a hot tub drain and clean. To ensure that everything was cleaned and safe for the homeowners to use, we also cleaned the filter. 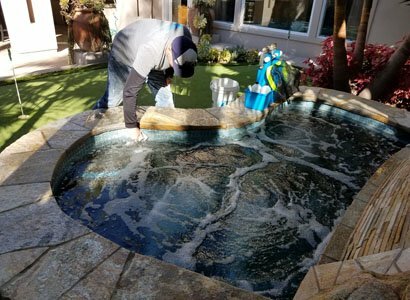 During normal weekly hot tub cleaning here in Carmel Valley, we always go through the same motions making sure that we treat every hot tub, spa and swimming pool the same every visit. Cleaning a hot tub is not very difficult when you think about simply removing the debris and leaves. It is when you move to the water’s chemistry is where it gets tricky. Hot tub water chemistry is slightly more difficult to balance if you’re not careful as it is a small body of water that can change chemical ranges quickly with a little chemical added. Having a professional service company performing your weekly hot tub cleaning service allows for you to feel comfortable when using your spa or hot tub that it is safe for your family and friends. Testing the water chemistry, cleaning the hot tub tile, vacuuming the floor and making sure the baskets are cleaned of dirt and debris is only part of our weekly hot tub maintenance. 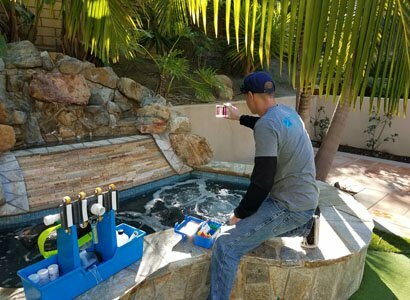 Your spa or hot tub equipment is also an important part of this service in Carmel Valley, San Diego. 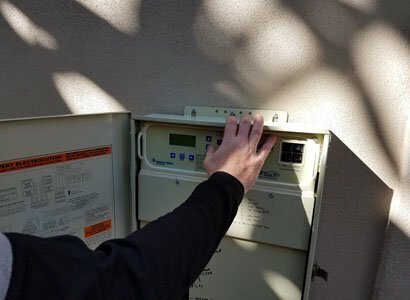 Because they have a Pentair IntelliChlor salt water chlorine system and automation for the hot tub, they will need to have the levels adjusted using the Pentair EasyTouch control system. Salt cell cleaning is also a periodic service depending on the amount of calcium build up on the cell itself or on average every three months. ProTouch also empties all pumps and baskets to ensure proper flow and no standing organic material in the system that may cause flow issues and possibly even a hot tub algae problem. We will also check to verify there is no visible algae build up inside of any of the pumps that may not run very often. 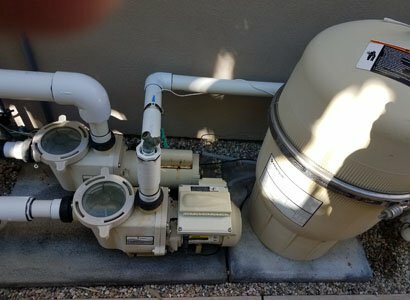 Pumps sitting stagnant over time will grow alga and will need to be treated with a small amount of chlorine to kill it off and preventing it from getting into the clean hot tub or spa. 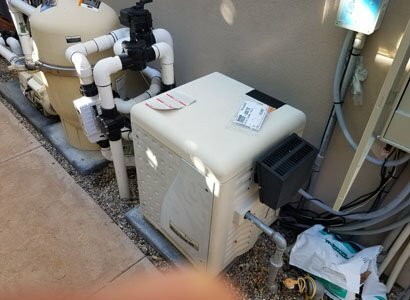 Occasionally performing a quick test of the spa or hot tub heater which is a Pentair MasterTemp to verify that the heater turns on without issue. The last thing you want is the perfect chance to utilize the spa or hot tub and you go to turn it on and nothing happens. 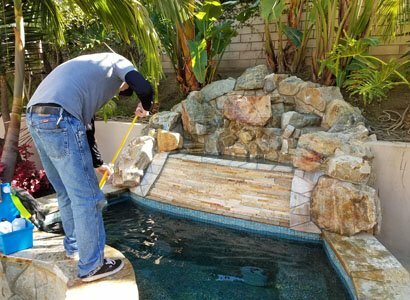 This again was a portfolio of a hot tub service in Carmel Valley, CA, 92130 though, we do offer complete weekly hot tub maintenance services throughout San Diego. If you are having issues with your hot tub or just tired of taking care of it yourself, feel free to contact us and we are happy to help.